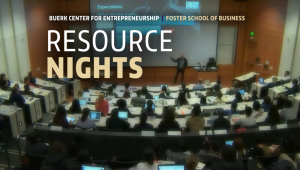 Each week you can read a recap of the previous Entrepreneurship Resource Nights (Business Plan Practicum) session. This week, instructor John Zagula (founder, Ignition Capital) lead a class featuring Hope Cochran, managing director of Madrona Venture Group and Foster Librarian Jason Sokoloff. We left the dreaming phase of our class and entered the thinking and planning phase this past week. Core to that is truly understanding and balancing risk and opportunity. We talked about this from various angles. We introduced various tools and approaches including the 3 C’s model and SWOT to understand the playing field and landscape of what you are up against in turning your ideas into a real business. We heard from Hope Cochran, an exceptional practitioner of assessing and embracing both risk and opportunity in life, career, and investing. We put some of these concepts into a practice analyzing real industries and businesses from your own ideas (Yay teams!) with the help of our wonderful Foster Librarian Jason Sokoloff. He also introduced the class to the use of the amazing (FREE) tools at student disposal to back your playing field assessment with real data and analysis. Finally, we closed with an investor perspective of how to prioritize these risks. We are going to be talking all about strategy with CEO strategists no less! We are in the second part of the second part, which involves going from analysis to decision making. Guest(s) include Xiaoyu (Renee) Wang, CEO of Castbox, and Tom Gonser, founder of DocuSign. Hollomon Health Innovation Challenge: Terri Butler – Reminder the deadline to apply is Monday, February 11! Alaska Airlines Environmental Innovation Challenge: Lauren Brohawn – Reminder the deadline to apply is February 19!